Who needs a portable (bench-wood) table saw? 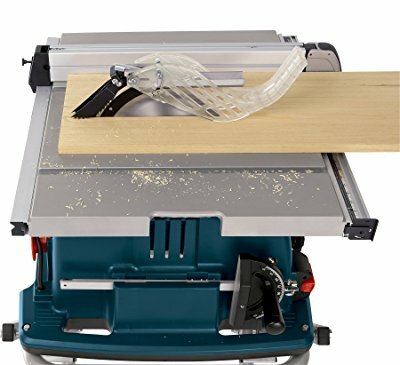 What to look for when buying a benchwood table saw? What parts are included in the package? Check if blade arbor is bent! When talking about table saws, we mostly think of those large ones with huge cabinets first. They are undoubtedly the most advanced of them all, and every professional workshop has one. But they are not portable and you can’t carry them around without asking your friends and coworkers for help. Job-site saws are the solution because they are small enough to fit any car trunk, and they usually weight less than 80 pounds. Portable (also called benchwood) saws cost up to $1000, but there are so many of them on the market that finding the right one for your needs and budget can be challenging and time-consuming. Portable (also known as benchwood or job-site) table saws are the most affordable and lightweight from all types. They are designed especially for workers who need to carry them around often, so they need to be light and small. They are mostly made of iron, plastic, and aluminum, and they often weigh less 50 pounds. Most of them feature universal motors with direct drive, which are not as durable as other types, but they have higher power output ratios for their size. On the downside, they have shorter rip fence and they don’t cut as precise as other larger types. Their motors are powerful enough, but they don’t offer the same level of stability as some other larger types. There are hundreds of benchwood saws on the market, but only a few of them received praises and high ratings like the products listed below. For more information on how to choose the right table saw for your needs, you are welcome to read our buyer’s guide. 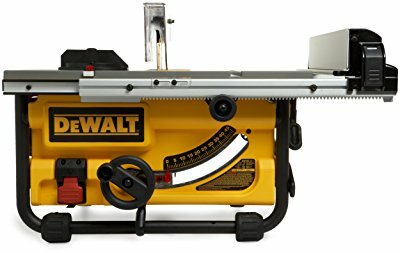 Not only is Dewalt DW745 ranked on top of our benchwood list, but it is also ranked on our top list of all types of table saws. Dewalt brand was established back in 1924, and there aren’t many workshops in this world without at least 1 of their power tools. They are one of those companies with the highest reputation, which results in high quality of their tools and other products. DW745 offers everything that you wish from a lightweight and portable table saw. It weighs about 45 pounds, so its portability is not a question. It comes with a 3-year limited warranty, 1-year free service contract, and 90-days money-back guarantee if for some reason you aren’t satisfied with its performance. This really says a lot about the quality of Dewalt power tools. Just like most similar products, DW745 features 15 AMP motor, which delivers all the power you need for cutting through hardwood lumber. If we would have to highlight the best feature of Bosch 4100-09, it would be its innovative gravity-rise stand, which is included in the package with no extra costs. When we went through more than 200 positive customer reviews, we found that most of them highlighted the easiness of use and portability. Some job-site saws don’t have a motor with enough power for pressure-treated lumber, but 4100-09 features corded-electric motor which generates 4 horsepower and is capable of satisfying anyone’s needs. It reaches up to 3650 RPM, so making a perfect clean cut is not a problem. Bosch 4100-09 measures 39.13 x 30 x 20.9 inches and weighs 99 pounds with table stand included. Warranty coverage has never been an issue with any Bosch products, and 4100-09 is no exception. It comes with 30-days full money-back guarantee and 1-year service protection plan. 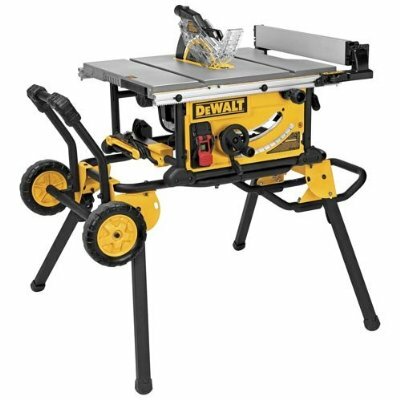 Dewalt is one of the leading companies of the woodworking industry, so it’s not a surprise that several of their products managed to get into our top 5 list. Compared to its predecessors, DWE7491RS has a larger dust collector, improved rolling stand system, and more power, so the blade can reach up to 4800 RPM. 15 AMP motor is appropriate for any DIYer or professional woodworker. It reaches up to 7800 RPM, which makes it capable of cutting through any hardwood with precision and ease. It is larger and heavier than some other portable products. It weighs 110 pounds and measures 31 x 24.5 x 31 inches, but it is still portable enough thanks to its advanced rolling stand system. DWE7491RS comes with 3-year limited warranty by the manufacturer, so you don’t need to worry about it breaking down any time soon. For more info, you can check out our reviews section. We have went through descriptions of several benchwood table saws and analyzed hundreds of customer testimonials and reviews. You might ask yourself why didn’t we include more job-site saws on our list, but there is a good reason for that. We found a lot of negative feedback about many products out there, so we simply can’t recommend them all. Here are a couple of things you should look for before buying and also after you have already received one. These are the 3 biggest reasons why some other products didn’t manage to get into our list. When considering a table saw, one of the first, basic decisions is whether to purchase a portable table saw or a stationary table saw as a benchtop table saw, contractor table saw or a cabinet table saw. Portability. Obviously, these saws are designed to move from job site to job site or be moved around your home workspace. Portable table saws can be handy if you have limited working space, and thus must maneuver the saw around, or if you like to work indoors and outdoors. Size. Stationary table saws, especially cabinet saws and contractor saws, can take up a lot of space versus a portable table saw. Smaller Jobs. A stationary table saw that’s meant to handle large stock, will not perform better on a smaller stock, like pine or floorboards, versus a smaller portable table saw. Power. A portable table saw will require less power and thus require a lower voltage at the outlet. Most portable table saws have 1 horsepower or 2 horsepower motors, which can easily cut plywood up to a three-quarters inch thick. Size. Portable table saws are typically smaller than stationary saws, which can make cutting thick plywood and other large wood stock more difficult. Vibrations. Portable table saws, because they are not fixed in place, can result in more vibrations across the saw making straight cuts more challenging. Noise. Portable table saws can be noisier than stationary saws that have their motor mounted inside a cabinet. Portable table saws typically have a lighter motor, smaller workspace and wheel based legs. However, look for supports that can extend from either side of the portable table saw. This can support cutting larger pieces of wood. Some customers have complained that they didn’t receive a complete package, and several parts were missing without a warning from manufacturers. The first thing you should do when you receive a brand new table saw, is to check if all parts arrived with the package. If anything is missing, you should immediately contact customer service and let them know. This happens on very rare occasions, but it’s still one more thing to look after. This also happens on rare occasions and mostly during transportation. If blade arbor is bent out of alignment, you simply can’t make precise cuts. Warranty coverage often requires you to signup a free contract that comes with a product. Simply signup a warranty coverage, and send it to the manufacturer, so you can claim your warranty in the future. This should be the first thing to do before you start using it because the warranty might not be valid. When we made this list of the best portable table saws, we checked out hundreds of customer testimonials throughout the internet. We have ranked them based on their ratings, overall satisfaction and price.